It wasn't one of the more memorable games of the season. Then the game went to overtime. If ever there was a textbook example for why the new 3-on-3 OT format has been a success, it would be tonight's game. A wild and exhilarating overtime followed what had been a fairly mundane game for large stretches of time, and Kris Letang roofed a backhand shot over a sprawling Cam Ward to give the Penguins a 2-1 win. The Hurricanes came out in the first period and tested Fleury early and often. Jordan Staal won a puck battle behind the net and made a great no-look pass to Andrej Nestrasil all alone in front, but Marc-Andre Fleury made a great save to keep the game scoreless. Shortly after, a Patric Hornqvist tripping penalty gave Carolina a PP, and Fleury again was forced to make a great glove save in tight, this time against Kris Versteeg. 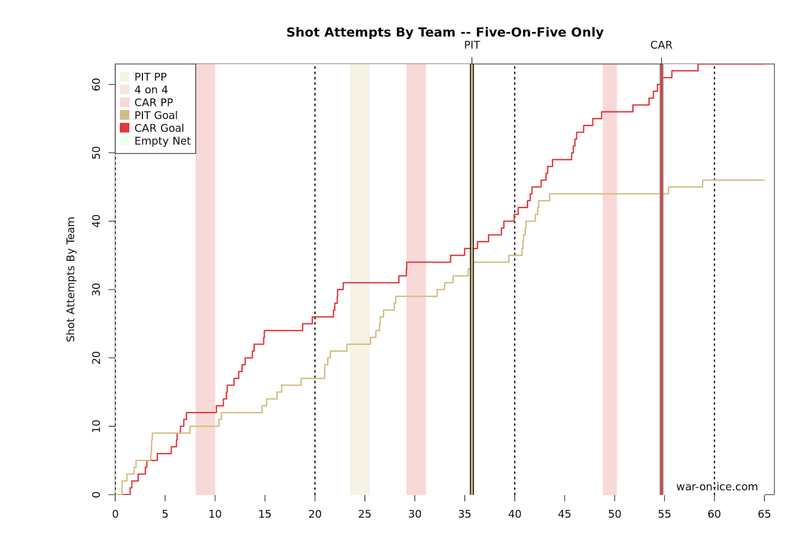 Carolina was controlling the possession game, but they were no match for Fleury in the first. They were also no match for the Pittsburgh 2nd line, who dominated gameplay in a game that saw their teammates routinely outmatched. Phil Kessel in particular was flying, registering 11 of the team's 46 shot attempts at 5-on-5, and it's only fitting that his play was rewarded late in the second period. Kessel took a feed from Cullen coming out of the cycle and snuck it past Cam Ward inside the near post to open the scoring. For a while, it seemed like that was going to be enough for the Pens to prevail 1-0, but the Hurricanes weren't going away without putting up a fight. Nestrasil, who was robbed by Fleury in the 1st period, skated the puck down the right boards and this time managed to beat the Penguin netminder with 5 minutes left in the 3rd to force overtime. The extra ice forced the teams to open things up, and the resulting OT period was a track meet filled with chances. Letang picked off a pass attempt to a streaking Jordan Staal to prevent a breakaway early in the period that led to an extended Pens possession in the Carolina zone. From there, the teams would feel each other out a bit before trading rushes the full length of the ice. Cam Ward stood on his head in the extra period, denying Crosby on a couple chances and making a great recovery to turn away a Hagelin shot off the rebound. 5 minutes wasn't enough to determine a winner, and after the first 5 shooters all missed in the shootout, Letang got Ward to bite on a shot fake and was able to take it to the backhand and end it. It was a game that showed why the Carolina Hurricanes have been one of the best possession teams in the league this season, and they controlled play for stretches at a team en route to posting a score adjusted 53.9 CF%. However, they had no answer for the speed of the Pens 2nd line, as Cullen (62.4 SACF%), Hagelin (60.0 SACF%), and Kessel (59.8 SACF%) were consistently Pittsburgh's biggest threat on the night. The win lifted the Penguins into the 1st wild card spot, just 1 point back of the Islanders for 3rd in the Metro. Pittsburgh will travel back to Florida Monday night for their next game against the Panthers, and they'll look for a repeat the success they had in the final minutes of the game as they stormed back to erase an 0-2 deficit on a night that saw Sidney Crosby score his 900th career point.